Often on the boat’s back deck, the challenge is fishing the circumstance that you’re confronted with, not the situation you select. Imagine a front deck angler controlling the boat, and fishing a vibrating-jig pattern. As the front deck angler fishes, their targets will probably be obvious. Let's say they are working a stretch of the bank from left to right. Imagine those same targets but coming down the bank from the opposite direction, right to the left. With excellent casts and a 'snag-proof' lure such as a frog, spinner-bait, top-water plug, … those targets going the other way are there for the back-deck angler to exploit. There will be prime ambush angles that can only be effectively targeted from the Reverse Angle. 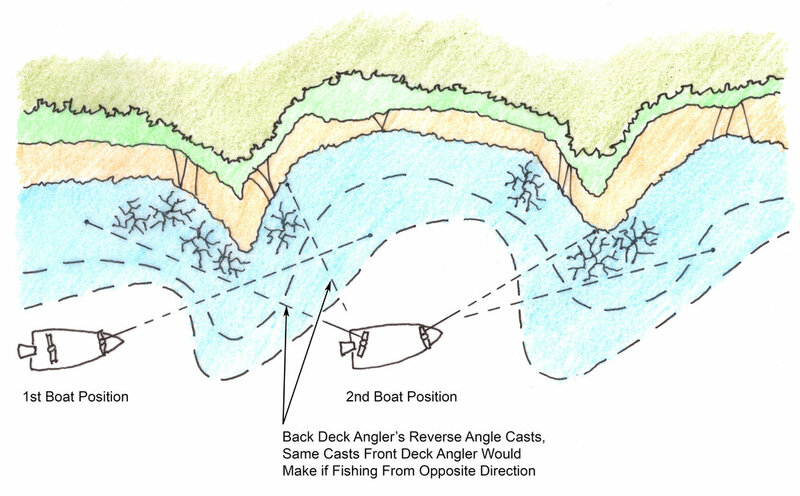 At each spot, from the back deck, there will be a moment in time when you have the best position for the reverse cast. When it comes to micro-topography and cover elements the Reverse Angle can produce strikes that the forward presentation will miss. That’s the Reverse Angle, and why the fish do not know which way the boat is going. The 34th WON BASS US Open is about to get started on legendary Lake Mead Nevada September 12th – 14th.